Let’er Rip outfitter is all you need to get the Trophy of your lifetime. The Guides are friendly and really know what they are doing. You won’t regret booking a hunt with these guys. I have booked 2 hunts with them and both my son and I had great success. A special thanks to Bill and Ricardo. Give them a call if you want to hunt big game. Can’t wait to book our next hunt! The hunt with Let Er Rip Outfitters was a great experience. Successful or not the “get after it” attitude is how I hunt and the fact that the two guides, Joey and Ricardo were of like mind made for a fantastic hunting adventure in my old home state of Arizona. The end result only topped off the few days I had to accommodate the hunt. Thanks Let Er Rip Outfitters crew. I want to take time to say a big “Thank You”, for hosting myself, and my other Trophy Time TV staff member on my recent visit with Let Er Rip Outfitters. This was my first time hunting in Arizona, Bill and his staff made it a great experience. 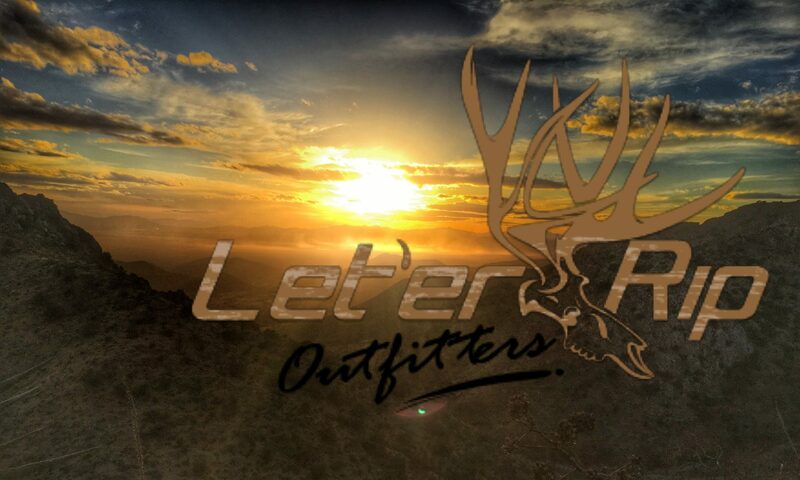 Let Er Rip Outfitters are everyday people with a professional agenda to get you on game. Let Er Rip Outfitters has the knowledge to guide you on a great hunt seeing lots of animals. Bill Babiash, Ricardo and Joey provided me with a hunt and memories that will last a lifetime. From the minute I got to camp, it was non-stop action. Bill took me to the mountain where he had been seeing all the deer and where we would be hunting the following morning. I could hardly sleep. When that morning finally came we got out to the hunting spot and immediately started seeing deer (7 bucks and 20 does). Bill and Ricardo glassed up a large shooter buck, Bill and I hunted this monster for two hours but we’re unable to get a shot. Ricardo pinged us on the radio and told us he had spotted another buck bedded down. We got in position, Bill asked if I wanted to take this deer or if I wanted to wait for the monster we spotted. I was fine taking this deer, it was my first Coues buck. I made the shot and Bill and co. helped get the deer back to camp, skinned and cleaned it. I felt like I not only met great people but made life long hunting friends. I HIGHLY recommend this hunt! When you think of Coues Whitetail Hunting in Southern Arizona you should think of Let’er Rip Outfitters. Bill has hunted and guided this area for over 30 years and it showed. Bill is the most professional and knowledgeable guide I have ever hunted with, the camp and gear were top notch, but more importantly his knowledge of Coues and the country they live in was unsurpassed. He shares your enthusiasm and has a vested interest in your success as a hunter. He was able to put me on Deer every single day. While my particular draw was in October with a higher number of Hunters and only a 28% success rate for the unit we still beat the odds and made it 100%. I hunt with family every year in Maine and Hunting with Bill feels the same way. Give him a call if you are thinking of hunting Coues in Southern Arizona weather it’s your first hunt or a Trophy hunt you won’t be disappointed. Thanks again for an awesome experience and great Hunt! When the time comes, and you finally draw that AZ elk tag, Let’er Rip Outfitters should be your next phone call. I had the privilege of hunting a week with Bill Babish this archery bull season, and let me tell you this guy knows his elk. We were on them all but 2 times we went out. Unfortunately, some technical problems with my bow, and a bad case of bull fever led to 5 misses. Bill was just as hungry as I was and always ready to go again, with nothing but words of encouragement when I started getting down on myself for missing. Being my first drawn archery tag, and only my 3rd year hunting archery, with Bill’s superb tracking ability, I got the opportunity to pull back on 5 bulls! So when you draw that elk tag, give Bill at Let’er Rip Outfitters a call, hopefully you don’t need 5 chances to get ‘er done, but if you do at least your guide will be just as hungry on the last one as he was on the first one. I just wanted to thank Bill Babiash and the rest of the crew at Let er Rip outfitters for the great hunt. Mule deer were plentiful and they run a top notch operation. I can’t wait til January to go again. If you need a great guide service, give them a call. You WON’T be disappointed. I just wanted to say thanks for the awesome time with the family of Let’er Rip. The beautiful landscape and abundance of wildlife was more than expected, as well as the quality and quantity of mature Mule deer bucks. Looking forward to being back at camp next January with all of you!